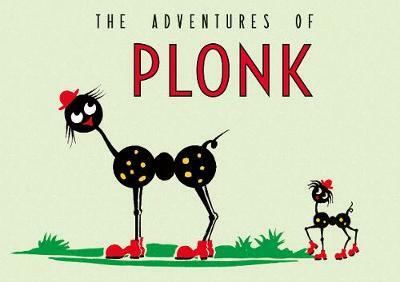 Plonk is an adorable little creature who lives on a magical island, far away from our world. He's completely unique, and as far as he knows, he is the only one of his kind. His island has lots to keep him occupied: beautiful beaches to play on, the warm sea to swim in and ponds to go ice skating on in the winter. However, life on the island can be lonely. Lots of ships pass by his island, but none ever stop to pay him a visit, which makes Plonk very sad. Life takes a turn for the worse when he is captured by a wicked witch and becomes her servant. Managing to escape, he is then promptly captured by a pony-man, who makes him give rides to children on the beach. As he runs away again, Plonk meets a friendly gnome, who tells him how to find the Good Fairy, who will help him home. Before he knows it, he is on the Good Fairy's magical boat, sailing back to his island. Finally safe again, he resumes his quiet life, but cannot help but feel lonely still. But Plonk's life changes when the Good Fairy pays him a final visit, bringing him a very special gift... The Adventures of Plonk is a charming, beautifully illustrated children's book that will appeal to young children aged 0-5 years old. The esteemed fashion designer, Hussein Chalayan, MBE, imprinted some illustrations of Plonk for his Parisian fashion show, `Pasatiempo (Cuba Calling)' in 2016.